Now through August 31, 2011, Precision Reloading is running a great promo that can save you 10% on your order. This promo was created for LongRangeHunting.com, but our readers are allowed to use the promo codes as well. There are four different promo codes: LRH1811 ($10 off $100 or more); LRH2811 ($20 off $200 or more); LRH3811 ($30 off $300.00 or more); and LRH5811 ($50 off $500.00 or more). Type in these codes during online “check-out” to get your savings. In addition to the promotion described above, for August, Precision Reloading has cut prices on many popular reloading items, including Berger Bullets. Below are listed some of the August Specials. NOTE: Sale products are limited to quantities on hand. Sales ends August 31 2011. Savings may not be combined with the promo codes above. Save $2.20-$29.70 on In-Stock Berger Bullets. with any Z3 scope purchase + Free Shipping. with any Spotting Scope Body and Eyepiece Combo Purchase. 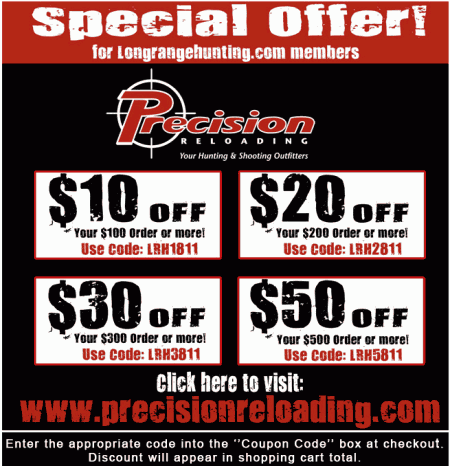 Share the post "Money-Saving Offers from Precision Reloading"